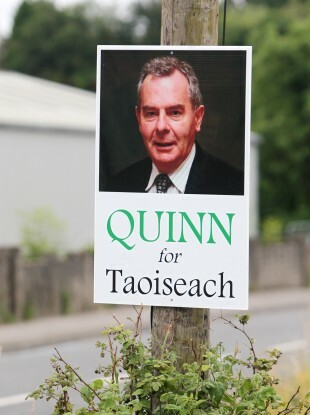 A sign urging Seán Quinn be elected Taoiseach near Ballyconnell in Co Cavan. WHEN SEÁN QUINN was jailed for nine weeks by the High Court earlier this month it was a landmark moment in this post Celtic Tiger era. The long-running saga involving the former richest man in Ireland, his family and the most infamous bank in the history of the State has now reached a point where people are going to jail with Quinn following his son, Seán jr, who served three months in Mountjoy earlier this year. But there is still some way to go before the whole issue will be resolved. Legal battles are taking place in the courts here and in Europe and are set to run for months, if not years, before they reach their conclusion. Furthermore, in the end we cannot be sure what will happen to the millions of euro the former Anglo Irish Bank – now Irish Bank Resolution Corporation – claims it is owed by the Quinns. Who are the Quinn family? It is Seán sr who has drawn the most attention as the businessman who became the richest Irishman in history with personal wealth of around €4.7 billion which made him the 164th richest man in the world in Forbes magazine’s 2008 Rich List. The accumulation of that wealth began in 1973 when Quinn, who was born in Derrylin in Co Fermanagh, borrowed £100 to set up a gravel business – Sean Quinn Quarries – which supplied washed sand and gravel to local builders and farmers. It wasn’t long before he was diversifying into other areas like cement and glass manufacturing. This would lead to the establishment of the Quinn Group of companies which built up a range of interests in various sectors including most notably insurance where the Quinn Insurance company offered low rates that shook-up the Irish market during the boom. This arm of the empire went on to become one of the country’s most successful insurers. By 2008 it was Ireland’s second biggest insurer and accounted for half of all revenues being generated by Quinn and his family. It even expanded into the UK market. Quinn also got into hotel and property management with his umbrella company, the Quinn Group, and built up a substantial property portfolio through over 70 companies in 14 different countries. This portfolio is estimated to be worth some €500 million and includes the Kutuzoff tower block in Moscow, which according to the BBC generates some $22 million a year in rent. There is also a large shopping mall in the Ukraine which generates similarly hight rents and then the Belfry hotel, the home of the Ryder Cup, and a number of other hotels in eastern Europe. In 2008, Forbes hailed the Quinn Group as “one of Ireland’s most successful companies” and it’s little wonder with such a Midas touch as Quinn appeared to have back then when it came to business that he was hailed as ‘The Mighty Quinn’. Where does the family come into this? While Quinn continued to run the Quinn Group during its most successful years, he gave actual ownership of the company to his five children, all of whom worked in the Quinn empire at some point or another and all of whom are involved in the current legal battles. The Quinn family controlled Quinn Insurance, where most of the revenue was generated. The main cause of Seán Quinn and therefore the Quinn family’s problems is the substantial stake in the former Anglo Irish Bank that was built-up during the boom years. Quinn’s interest in the bank was not unusual given its success during Ireland’s Celtic Tiger years which led to it being heralded as the Best Bank in the World in 2007. But it was the way way which he went about building up this stake which would eventually leave him saddled with an enormous debt. Rather than buying shares, Quinn chose a complex financial instrument known as contracts for difference (CFDs) which essentially saw him bet on the share price of the bank using far less money than he would have done had he bought shares in the normal way. With CFDs if the price rose he stood to make money but if it fell – as it did dramatically as Anglo began to go under during the financial crisis – he stood to lose a lot. Having not bought shares via the conventional means, Quinn was able to build up a 28 per cent stake in the bank unbeknownst to it and senior executives like Seán FitzPatrick and David Drumm. When the bank discovered how much the Fermanagh businessman had invested in it, executives sought to address the matter knowing it could go under if news of Quinn’s near 30 per cent stake in the bank became public. So what did the bank do? Well three of its employees allegedly broke the law, according to the Director of Public Prosecutions which recently brought charges against three former Anglo executives – Seán FitzPatrick, Pat Whelan and Willie McAteer – for allegedly arranging for Anglo to give loans to Patricia Quinn and her five children as well as ten other clients – the Maple 10 – for the purposes of buying shares in the bank in July 2008. In buying the shares Anglo hoped that it would not only unwind the significant stake that Quinn had personally built-up but that it would also prop up the share price and alleviate investor concerns about the viability of the bank as the property market in Ireland crumbled and people struggled to repay the big loans Anglo had distributed during the boom years. No. In September 2008, the Irish government took the ill-fated decision to guarantee the banks including Anglo which was beginning to build-up huge losses as the property market collapsed and in January 2009, the bank was fully nationalised with the government eventually beginning the process of winding the bank down. But how did all this impact on the Quinns? As Quinn began to lose money on the CFDs when Anglo’s share price fell dramatically and the bank eventually went into government ownership, he got desperate. By his own admission he took some €280 million out of his insurance company to cover losses he incurred from his entanglement in Anglo. “The money I took out in 2007 and 2008 should not have been taken out, hands up I was wrong,” Quinn would later tell Vincent Browne in an August 2012 interview. In October 2008, Quinn was fined a record €3.45 million by the financial regulator and though he stepped down as chairman of the company his family retained control of it. But even so, Quinn Insurance continued to post significant losses including €125 million in 2008 and €706 million in 2009. All the while Quinn was also racking up losses on his Anglo shares and Quinn Group made an operating loss of €888 million in 2009, largely due to the troubles with the insurance arm. The money Anglo claims it is owed would eventually run into billions. Eventually in March 2010, the financial regulator had receivers appointed to Quinn Insurance. Just over a year later, Anglo Irish Bank, which would become Irish Bank Resolution Corporation, moved into to take control of Quinn Group with the Quinn family removed from the company and the assets passed to the receiver. Now Seán Quinn maintains that that there was significant cash reserves within the company to cope with the crisis and that in March 2010 – when the receiver moved in – there was €250 million which made Quinn Direct “extremely profitable”. Anglo now claims that he owes them over €2 billion from debts built up from betting on the share price. So has this dispute between Quinn and the bank been resolved? Certainly not which is why there is currently a very complex legal battle under way which you’ve probably been hearing quite a lot about. Basically, it boils down to Irish Bank Resolution Corporation (formerly Anglo) chasing Quinn for the money the bank says he owes them. Quinn claims that he could have paid back the money given the opportunity, as we outlined above, but this would only have been possible had he kept control of the insurance business which, as we know, the bank took from him. Quinn has said that IBRC is pursuing a “vendetta” against him and his family and is wrecking his old company. The Quinns and their supporters claim that Seán Quinn had a plan to pay back Anglo but the bank would not accede to this request. But their case could be undermined by findings of contempt against Seán, Seán jr, and nephew Peter Darragh Quinn for attempting to put assets beyond the reach of the bank last April and violating court orders to stop doing this. For this Seán Quinn jr has already served three months in jail while Seán sr is currently serving a nine week sentence. But Peter Darragh Quinn or ‘Peetie’ as Quinn refers to him has so far evaded a Garda arrest warrant having travelled north of the border and remained there since he was sentenced earlier this year. During the court case one judge described the process of putting assets beyond the reach of Anglo as one of “mesmeric complexity” that “reeked of dishonesty and sharp practice”. One court hearing heard that Quinn allegedly falsified documents in July of last year in order to take control of an office block in Moscow and put it into an offshore company in Belize, beyond the reach of Anglo. While the Quinns admit that they owe some of the money and have made mistakes they dispute the legality of much of it, a claim that could be strengthened by the perilous state of Anglo before it was taken over by the government. Ultimately it will be for the court to decide whether the €2.3 billion that IBRC is claiming Quinn owes should be paid back. If the court decides that the debt is illegal and therefore unenforceable then the Quinns will be due compensation. But when all that might come to pass is not known and it could be years before it does. So why should we care about a lengthy court battle? So we’ve got to pay for this? Boy, people must really dislike this Quinn fella now? There’s certainly plenty of people who do especially in the southern part of the country but the further north you go the stronger the support for Quinn and there is one simple reason for that: Jobs. Quinn and his enterprises created thousands of jobs in the north particularly in the cross border areas of Fermanagh and Cavan, areas which were traditionally starved of jobs. This economic poverty all changed when Quinn’s empire began to grow and led to the creation of around 5,000 jobs for people in these areas alone. That sort of employment is not only good for those employees but had knock-on economic effects in the local area. As a result Quinn says he has received thousands of letters of support from well-wishers while at the same time acknowledging in an interview with local newspaper The Impartial Reporter that he understands the belief of many that he “messed up in recent years in relation to Anglo Irish Bank”. You’d probably be shy about supporting him? Not really if recent events in the north of the country are anything to go by. There have been regular rallies of support for the Quinns in the Cavan town of Ballyconnell where thousands have been in attendance including Tyrone manager Mickey Harte, former Meath manager Seán Boylan, player Colm O’Rourke and well-known priest Fr Brian D’Arcy. They offered their support for the businessman and his family in light of the jobs they have created over the past four decades. Workers at companies formerly controlled by Quinn in Cavan and Fermanagh have held walk-outs with properties formerly owned by Quinn but not in the hands of the bank have also been damaged in late night attacks. Concerned Irish Citizens, a group formed for the purpose of supporting Quinn, is seeking “natural justice for the Quinn family and the citizens of Ireland” and claims the vast majority of the €2.3 billion that the Quinns are said to owe IBRC was illegally loaned and the family cannot be held responsible for its recovery. At the moment Seán Quinn remains in jail until after Christmas, hoping he may be allowed out for his grand daughter’s Christening on 22 December on compassionate grounds. This week we learned that Seán Quinn jr has said he wants to help IBRC recover the €500 million of overseas property assets in attempt to purge his contempt of court. While in the meantime the legacy of the errors Quinn sr readily admits to continue to be felt with the recent loss of 285 jobs at the company formerly known as Quinn Insurance, now Liberty Insurance. Which just goes to show that if the battle in the courts is set to run for some time yet then so too will the consequences of Seán Quinn and his family’s fatal involvement with Anglo Irish Bank. Want to know more? Some further analysis can be found on the Financial Times, as well as BBC News. If there’s something you’d still like to know, get in touch: hugh@thejournal.ie. We’ll try to answer all queries. Email “Everything you need to know about the Quinn saga, but were afraid to ask”. Feedback on “Everything you need to know about the Quinn saga, but were afraid to ask”.